The joining of two lives in marriage is not an easy or fast task. There are many decisions to consider and much give and take that is needed to make a successful and long lasting marriage. You each come from different backgrounds. You were raised in different families and had different familial and educational experiences. You may have different needs and desires and goals for your life. Possibly for the first time in your life, you have to consider putting the wishes of another person before your own, at least part of the time. You both made or will make adjustments to your thoughts, words, beliefs and actions to accommodate the other. Perhaps he doesn’t like spicy food, but she grew up with it and loves it. Perhaps she wants to live in an elegant older home but he won’t put up with the many repairs and remodeling tasks needed to make it actually livable. 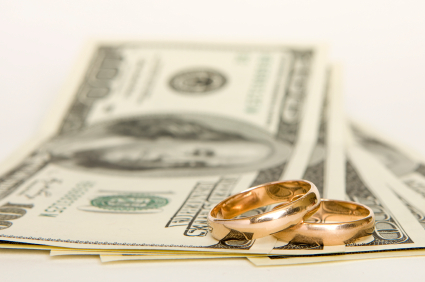 Money issues can severely hamper your chance of marital success and happiness. James McWhinney in Top 6 Marriage-Killing Money Issues, defines the main issues as unequal debt loads between partners; your money personality differences; power plays by the person making more; how many children to have; extended family (either providing money for their needs or having one extended family that is a lot richer than the other); and not making money management a joint venture. I’ve been married to the same wonderful man for 41 years now, and while I don’t claim to have the perfect marriage, we must be doing something right! However, I’m not a marriage counselor or therapist so consider your own needs and get help specific to those rather than solely relying on this post. Every marriage is unique! Here are some of my tips on how to get and stay on the same money track as your spouse. Although my spouse and I didn’t do this, we got lucky and had similar upbringings in the money sphere and we grew to have common goals. We did discuss whether to keep money separate or have one family pool at the start of our marriage. Since both of our backgrounds included managing money in a family pool, that is what we have always done. Explore your money personality with your spouse. Use the resulting profile as a basis for discussion of what parts to keep in your couple money personality and which to leave behind. Back in the olden days when we got married, not too many people were exploring money personalities. It took us years to understand that he was very risk averse and I more apt to take risks. However, we were both savers, so that helped us stay on track. On Family Money Values , I once explored why you need to understand your money personality. It helps you, your spouse, your marriage, your children and your heirs! To really understand your money approach and attitude, ask yourself and each other open ended money questions – about how your folks dealt with money, how you were raised, what you prefer and don’t prefer financially and etc. In our very first extended family meeting, with my spouse, grown boys and their wives; each couple discussed and wrote down answers to questions that I pulled from the book Estate Planning for the Healthy, Wealthy Family. These were questions such as ” Which of your parents made the financial decisions”. This took us all quite some time, but it helped us all better understand ourselves, our partners and our family’s approach to money. Another way to explore your money attitudes is to take a money type quiz such as the one on Practical Money Skills for Life which measures your propensity to acquire, spend or manage money or the one from CNN Money that takes just a few minutes and can also be a starting point for discussions. Some couples avoid money discussions, because frankly, they can be uncomfortable. Don’t be one of those couples in which one or both partner keeps secrets about what he or she is doing with money. Secrets such as one partner getting a new credit card, not letting their spouse know about it and running up the balance cause marital discord and individual agony. You are married, you are each individually responsible for the other guy’s debts if they were incurred during the marriage! Yes you are married, but you are still an individual as well. We all need time and space to ourselves occasionally and I believe this extends to money as well. Don’t come down on each other so hard for saving or spending that neither feels free to treat themselves. Don’t make snide comments when one wants to give to their favorite charity or the other wants to buy yet another new item for a collection. If these things become a problem, set aside time to discuss and agree on a solution. Don’t fall into the trap of assuming that whoever makes more money should be in control of the money. If you agree on your financial goals and approaches, neither of you will feel compelled to control the others money use. If All Else Fails, Get Financial Therapy! Some financial advisers are starting to offer counseling to help you and your family find your money values and goals. If yours does, think of exploring what they offer to see if it will help your situation. You could also explore actual therapy. There apparently are now financial therapists. How have you gotten on the same money track as your spouse? The following giveaway is brought to you by structured settlement quotes. com. Being on the same team with money is super important in a marriage. Luckily, Holly and I are similar in our thrifty habits. We talk about our money all the time and make decisions together. I can hardly remember ever having a money fight. I am glad for you. We don’t fight much either, but sometimes I wonder if one or the other one of us is just giving in. My fiancé and I very gradually combined our finances, and they’re still not totally combined. I think that we have different money philosophies, but the two different views compliment each other well. Sometimes couples don’t discover differences until something brings it to a head. One of the biggest problem a couple could probably encounter in marriage has to do with money matters and I agree with you that having a pre-marriage agreement on financial matters will greatly help. It also helps to open the line of communication when it comes to money and spending. Money and control – the feeling of having a voice or power in the marriage….kind of all the same thing – in my mind. 41 years that’s awesome! I agree that money problems can be a relationship killer. If I’m ever in one again, that will be a top priority to discuss finances and be on the same page. Good for you! If everyone could do that they would be a lot better off! Yeap! I’d like to win it! Its basically about making rules you’ll both stick to. Making rules makes things easier. Making the important things come first. I guess nothing but agreeing and talking can fix a rocky road of finances. How do you enforce rules between yourselves? I’m learning to live on a limited budget that’s different than we had before 2010. I do save $25 a month still.